Today, you can find a very small population of lions in India. Some of the last surviving Asiatic lions can be found in Gir National Park and in the Gujarat's Wildlife Reserves. The Gir National Park is one of the major wildlife conservation hubs that refuges more than 300 lions. To have a view of this majestic and courageous animal, guided jeep tours for tourist are available within the parks. 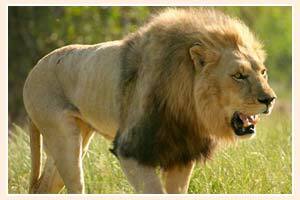 Compared to the African lions, the Asiatic lions have shorter mane and are smaller in size. They have long folds of skin on their undersides that most of the lion of the Africa do not have. They are generally found in grassland, savannas, woodlands and dense bush.